#9 Scott Dixon of the Ganassi Racing team at the driver’s introduction ceremony. The Verizon IndyCar series will be visiting Toronto later today and tomorrow for the second year of double-header racing in Canada. The first race will be held today after qualifying and then a repeat of the exact same race follows tomorrow (The drivers re-qualify tomorrow morning.) The last two double-headers this year saw no repeat winners, with Power, Castroneves, Huertas and Pagenaud all taking home wins. 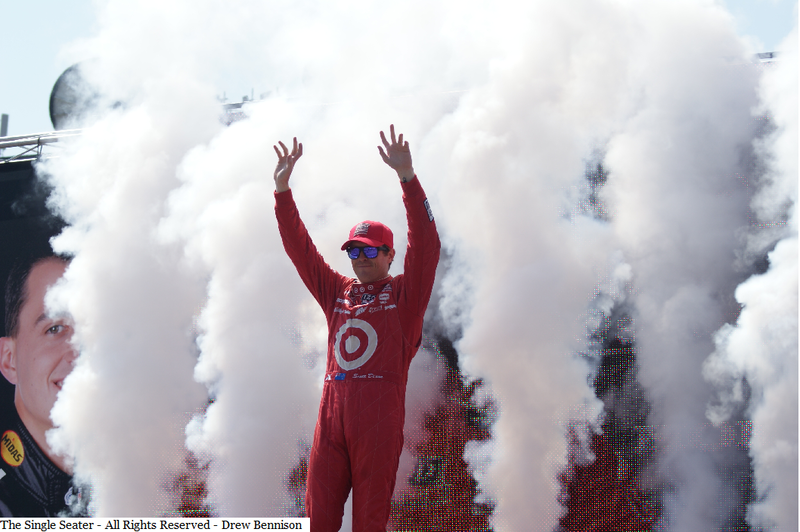 Scott Dixon driving for Chip Ganassi brought home a victory in both of the Toronto races last year (And is the only driver to win both back-to-back races). If he were to do the same again this year, he could see at least 100 points coming his way and a major boost in the championship standings. Depending on his qualifying position, he could see extra points for the P1 Award as well. Both Dixon and his new teammate Tony Kanaan will be looking for lots of points to catch up this weekend to get in contention for the championship with just 4 races to go after this. Cautions have been notoriously quick and scarce at Toronto, just 3 in the last race here. This year, expect green flag pit-stops and very, very short cautions yet again. Throughout both races last year, only 24 laps were run under caution out of the combined total of 190. That comes out to be 12.6% of the race. If the cautions don’t come out at just the right time, teams will have to change their strategy or risk pitting under green (Lap times are only around 58 seconds). With less and less cautions each year, the average speed has been building up over the past few years as well. In 2011, the average speed over the course of the race was 76.805 mph, last year we were up to 94.177. This shows that both the cars are getting faster, as well as less cautions are being thrown. The three double headers on the calendar this year mean a lot of points and ground can be made up on the current leader of the championship, Helio Castroneves. The top 5 drivers in the points are only separated by 66 points, and a win or two from any of them could send them into first place. Castroneves has been strong in Toronto in the past, coming in 6th and 2nd place in race 1 and 2, respectively. If he doesn’t give another strong showing this weekend, his lead could be in jeopardy. Over the last couple races, Castroneves has been all over the place, with a DNF, 2nd place and eight place finish. He’ll have to tighten up if he hopes to bring home the championship at Fontana. The rain delay and red flag brings up some interesting changes to the race. First off, the drivers will be sitting on the grid for a significant amount of time. They have to be ready once the green flag drops again. They were all ready for the green flag after the three or so warm up laps and now they have to calm done and get ready again. Second, the race will no longer have a standing start because of all the standing water that will be on the track. It will be a single file rolling restart which again brings a mental change that the drivers need to make. The rule for IndyCar is a two hour race limit if the regular number of laps can’t be completed (85 in this case). It looks like the Toronto race will fall under that two hour category if this rain continues. The drivers need to get calmed down and get ready for the green flag to drop within the next ten minutes here in Toronto. Especially since the points race is so close going into this weekend. Firestone is using the same rain tires throughout all the street tracks this year. There was rain in Houston as well, and the tires performed very good. But, Toronto has significantly less track grip than Houston did, with less grip on the cement parts of the track. Standing water is also going to be a problem on the track with the rain still coming down as the warm-up laps continue. Expect some spins and a very cautious race from all drivers out on the track.